I'm Flying! 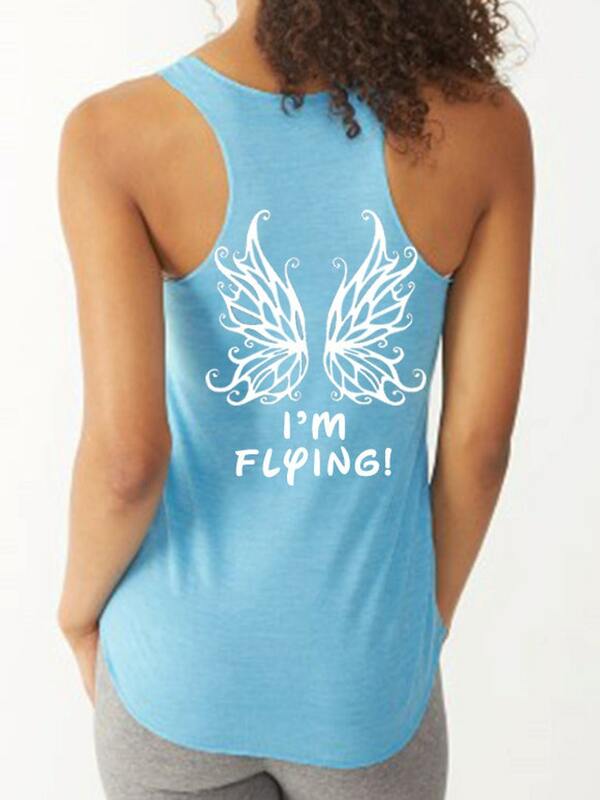 Disney style Tinkerbell tank.This shirt comes as shown with the wing design and saying on the back of the tank. If you would like this design in a different combination, please convo me. We can put one of our other sayings/images on the front of the tank for an additional charge of $5.00. Whether you are running, working out or just out about town, this sleeveless eco tank is sure to become a staple in your wardrobe. Crafted from unbelievably soft eco jersey, with a rounded bottom and raw edge hem, this is sure to become one of your favorite tanks. Custom orders are welcome. Just convo me. These shirts are regular fit, order true to size. Each shirt is custom made to order, so we cannot accept returns. Do not bleach. Machine wash in cold water inside out. Tumble dry low or line dry. Cute and soft shirt. will be a great shirt to run in. Very soft and comfortable. The thumb hole was very useful to me on my run so I didn’t have to use my gloves. Kept me warm enough to run with in 40° weather. I accept Paypal, MasterCard, Visa or money order. All payments are due before shipment. Please be aware that your order is not processed until payment is complete. Delivery time from the date of order is 1-2 weeks depending on inventory. Because each shirt is custom, refunds or exchanges are not available unless the item you received is not what was ordered. In that case, an exchange will be made. Please contact me before you leave any neutral or negative feedback, as I want my customers to be completely happy with their purchase. I ship USPS first class mail. If you require expedited shipping, please indicate so when placing the order, so I can adjust the invoice accordingly. We welcome custom order inquiries.We have created custom shirts for many different types of events, large and small. If you need any type of custom branding on any variety of items, please convo me and I can help you design something special and unique. Run like a BEAST look like a BEAUTY Disney Princess Style Half Marathon Marathon running tanks for women. And She Ran Happily Ever After Disney Style Half Marathon and Marathon running shirts for women.